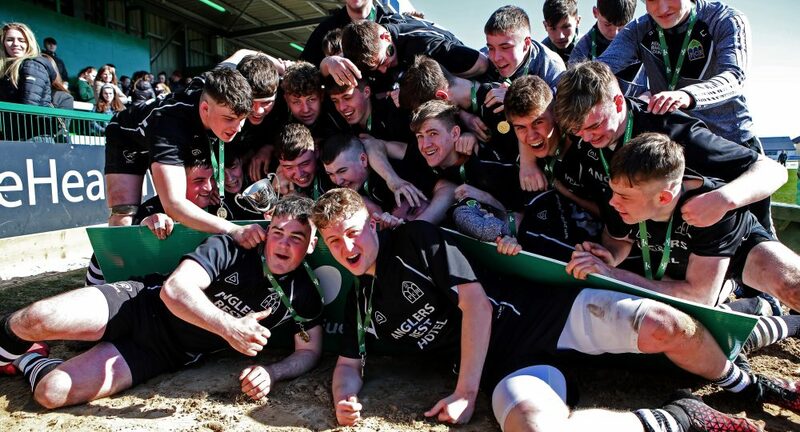 Presentation College Headford got the better of Gortnor Abbey of Mayo in a proper shootout of a Senior Development Cup Final in a sunny Sportsground. The sides split 11 tries between them in a game characterised by open, courageous attacking from both sets of young players. Gortnor Abbey had much the better of the opening stages here, dominating possession and enjoying long stretches in Pres territory. Flanker William Stevens made some eye-catching bursts up the middle and both Patrick Howley and Brian Timoney looked dangerous in their centre channels. 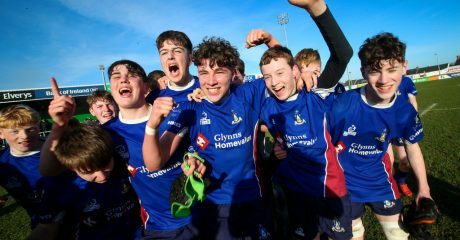 But they failed to make any early inroads on the scoreboard and when the first score of the game did arrive after 15 minutes, it went to the Galway students. In what was their first meaningful excursion into Gortnor territory, out-half Niall Egan cut through a half-gap in the defensive line to dive over for the score. Gortnor hit back with a quick brace of tries at the start of the second quarter. Daniel Howley had the first, emulating his opposite number 10 with a good sniping score in the corner. The second to take the lead was a brilliant team try, began with a burst up the middle from Timoney. He offloaded to Patrick Howley, who in turn reversed the line to full-back Michael Moran, who scored under the sticks. Howley’s conversion made it 12-5 but Pres would grow more and more into the game as the interval approached. They drew level on 31 minutes after a spell of pressure on the Gortnor line left an overload on the right wing and full-back Thomas Newell ran in the try. 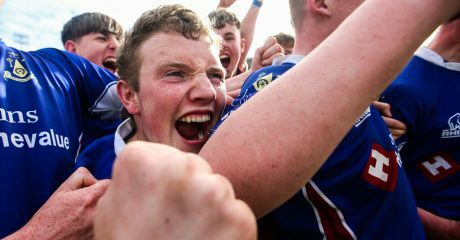 And they reclaimed the lead on the stroke of half-time, Egan driving over for his second try to leave it 19-12 to the Headford boys as they paused for breath at half-time. Gortnor were back within two five minutes after the restart as Jack Shakeshaft raced over in the right corner, but Pres responded with a converted try from Jack Walsh to widen the gap back to nine. A penalty from Patrick Howley cut their arrears back to a single score but Pres struck for what would prove a killer try with 20 minutes to go. Colin O’Reilly’s touchdown on the right and Egan unerring conversion, followed two minutes later with a penalty, left it 36-20 to the Headford boys. Gortnor continued to fight and did pull back a try through the excellent Timoney, but they had left too big a mountain to climb. Pres wrapped it up with their sixth try on 78 minutes, Egan completing his hat-trick and bringing his own personal tally to 28 points. 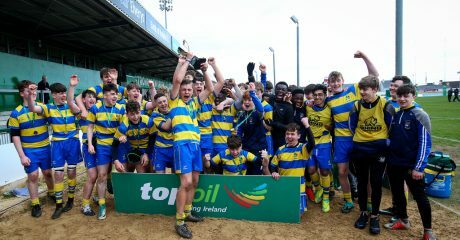 Patrick Howley ran over a try for Gortnor Abbey with the clock deep in the red but it was little more than consolation as the cup and the honours went the way of Headford. HEADFORD: Thomas Newell, Leon Reilly, Donnagh Murphy, Jack Walsh, Colin O’Reilly, Niall Egan, Evan Mohan; Jake Heneghan, John Flood, Ronan Ipek, Shane Walsh, Michael Loughlan, Evan McHugh, Gavin Lee, Cathal Roddy. Replacements: Darragh McDonagh (for Walsh 47), Jackob Knight (for Lee 61). 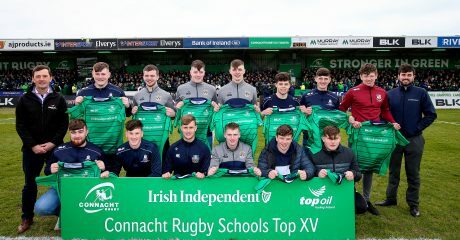 GORTNOR ABBEY: Michael Moran, Jack Shakeshaft, Brian Timoney, Patrick Howley, Darragh Gill, Daniel Howley, Derry Quinn; Mark McAndrew, Jason Feely, James Walsh, Martin Carr, Tom Mulhaire, Shane Howley, William Stevens, Conor McHale. Replacements: Derek Kenny (for S Howley 60), Craig McCormick (for Gill 73).